When Jacqui Lowman reached the summit of Mount Katahdin in Baxter State Park on July 14, 2015, she not only brought together a group of people to help each other achieve the “impossible” but began a journey that soon will take her across the country in an effort to inspire others. PRESQUE ISLE, Maine — When Jacqui Lowman reached the summit of Mount Katahdin in Baxter State Park on July 14, 2015, she not only brought together a group of people to help each other achieve the “impossible” but began a journey that soon will take her across the country in an effort to inspire others. Lowman, associate professor of professional communication and journalism at the University of Maine at Presque Isle, became the first person with paraplegia to summit Maine’s tallest mountain with the help of 16 volunteers from Aroostook County. Six of the volunteers were men who carried her using a “PiggyBackPack” carrier. 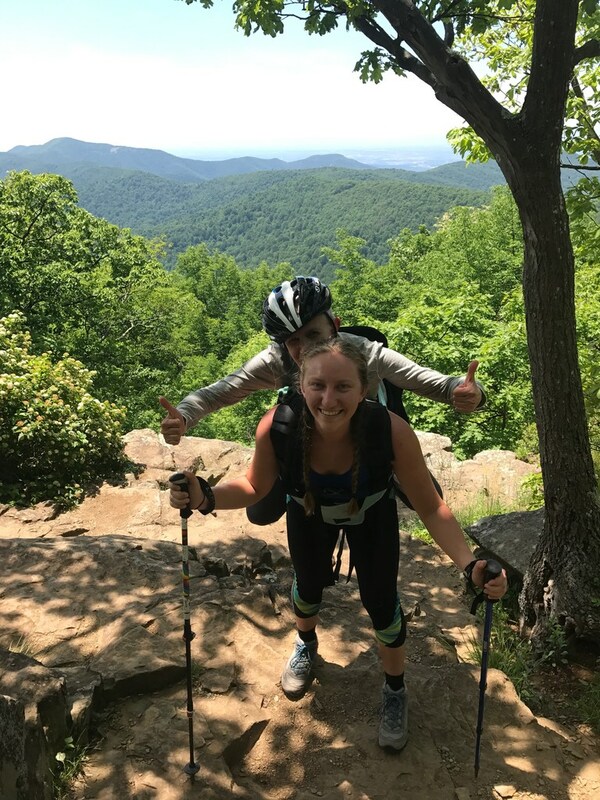 Since then, she also has hiked two sections of the Appalachian Trail in Georgia and Virginia as well as an area separate from the AT known as the Land Between the Lakes in Kentucky. Lowman and her UMPI students reached out for months to several colleges and recreation groups via email and phone calls before finally recruiting students and a professor from Clemson University in South Carolina for the Georgia AT hike. For the Virginia hike in Shenandoah National Park she was joined by a professor and student from Murray State University in Kentucky, a college student from New Jersey, a student from Unity College in Maine, and Lowman’s frequent hiking partner, Teri Haravan of Virginia. 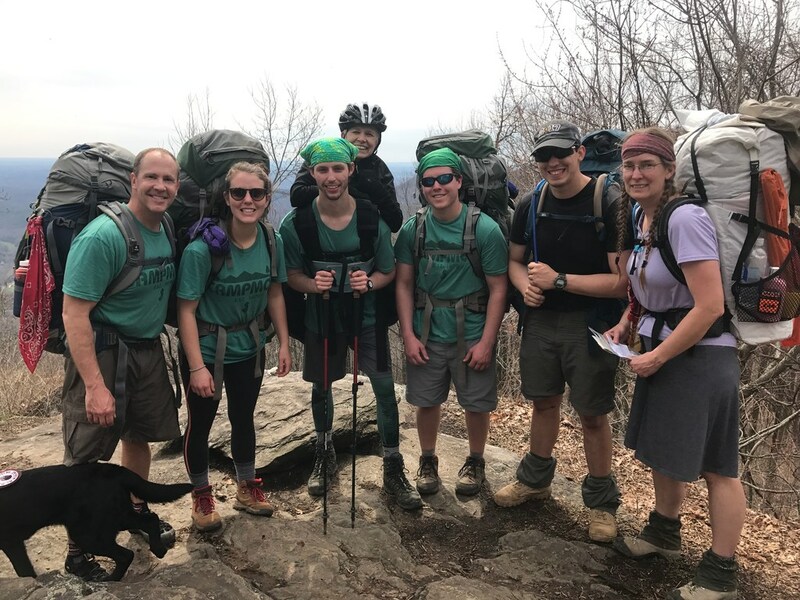 Hikers used an improved version of the “PiggyBackPack” known as the “JacPack” to carry Lowman 30 miles through the Georgia section of the AT in March 2017 and 10 miles per day in Shenandoah, testing their teamwork, perseverance and problem-solving skills. Now, Lowman is ready to take on another challenge as part of BEYOND LIMITS: Awaken Your Potential, the 501C3 nonprofit organization for which she is the founder. In June 2019, she will embark on a road trip that will take her and her service dog, Saint, through 15 states and five Canadian provinces as part of an effort to spread the message of BEYOND LIMITS. Part of Lowman’s inspiration for the road trip came from her long-term goal of one day visiting Cedar City, Utah, where her father, the late Jack Lowman, grew up. Since Lowman is already scheduled to attend an academic conference in Denver, Colorado, in June, she saw the trip as a great chance to finally visit her family’s roots and conduct more pubic outreach for BEYOND LIMITS. During her trip — which she is calling Back to the Roots — Lowman will drive from Maine and through New Hampshire, Massachusetts, New York, Pennsylvania, Ohio, Indiana, Illinois, and Nebraska before arriving in Denver. After staying in Denver for three nights, she will spend one week each in Utah, Wyoming and Idaho before making stops in Oregon, Montana and the Canadian provinces of Saskatchewan, Manitoba, Ontario, Quebec and New Brunswick. Although Lowman is open to the opportunity of gaining volunteers for future trail hikes, that task will not be her main focus on the road trip. This semester she has enlisted her two senior professional communication and journalism students — Brandy Smith of Liberty and Garrett DeLong of Presque Isle — to contact community organizations such as Rotary and Kiwanis clubs, youth groups, churches and chambers of commerce. Their hope is to arrange public speaking events for Lowman to interact with local residents and share the BEYOND LIMITS story and philosophy. Unlike a trail hike where she would mostly interact with her fellow hikers, Lowman wants to use the road trip to meet and talk with folks who might not have ever hiked or who face unique challenges themselves. 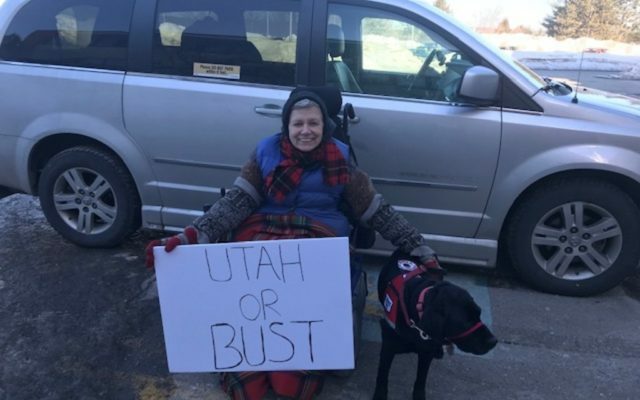 Through her many travels aboard her wheelchair accessible van, Lowman has come across folks who have been astonished that a person that relies on a wheelchair and service dog to maintain independence would be able to operate a vehicle herself. “I don’t think most people try to be mean. They just don’t realize what’s possible,” Lowman said. Lowman was born with spina bifida and is paralyzed from the waist down, but moves around independently thanks to her power wheelchair, a hand-controlled van, and Saint. She was first inspired to found BEYOND LIMITS in 2012 after a severe aneurysm forced her into months of rehab, where she had to learn to talk and eat on her own again. Following her recuperation and after stopping at the scenic overlook of Mount Katahdin, located off I-95 in Medway, Lowman realized that she had been given a second chance at life. She felt inspired to use that second chance to bring a team together, climb Katahdin and achieve what many might have assumed to be an impossible feat. This summer Lowman wants her Back to the Roots trip to educate the public on the challenges that people with physical disabilities face while traveling. Though Lowman’s students have researched and made reservations for hotels along her route that claim to be fully wheelchair accessible, she said she’s learned from experience that not all public places go the extra mile. Despite the challenges that might come up during the trip, Lowman and her students are hopeful that Back to the Roots is the next step that BEYOND LIMITS needs in order to inspire people to dismiss the word “can’t” from their mindsets. For Lowman, some of the greatest moments of her journey have been in hearing the small ways in which people have gone beyond their own perceived limitations. “One year after Katahdin, I was volunteering at Relay for Life and a lady, who said she was in her 80s, recognized me and came up to me with her walker. She said, ‘I’m so proud of you honey.’” Lowman said. Folks can follow along with Lowman’s BEYOND LIMITS adventures at http://beyondlimitsawaken.org/ and the organization’s Facebook page.